Coupons are a great way to offer discounts and rewards to your customers, and can help promote sales across your shop. If you want to use coupons with WooCommerce, you first need to enable them in WooCommerce. 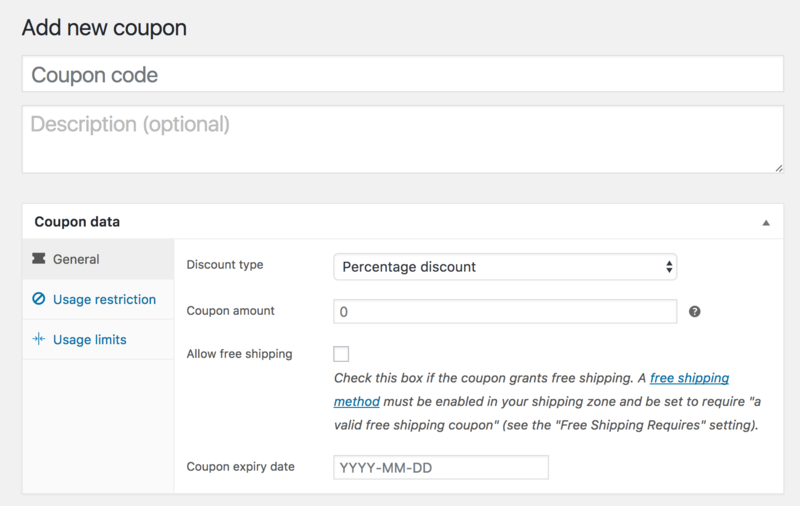 Go to: WooCommerce > Settings > General and tick the checkbox to Enable the use of coupons. Then Save Changes. Go to: WooCommerce > Coupons. Coupon code – Code used by the customer to apply the coupon. Must be unique as it’s used as an identifier. Description (optional) — Info about coupon, e.g., Dates in effect, promotion, compensation, ticket number. For internal use. Percentage discount – A percentage discount for selected products only. For example, if the cart contains three (3) t-shirts @ $20 each = $60, a coupon for 10% off applies a discount of $6. Fixed product discount – A fixed total discount for selected products only. Customer receives a set amount of discount per item. For example, three (3) t-shirts @ $20 each with a coupon for $10 off applies a discount of $30. Coupon amount – Fixed value or percentage, depending on discount type you choose. Entered without a currency unit or a percent sign, which are added automatically, e.g., Enter ’10’ for £10 or 10%. Allow free shipping – Removes shipping cost when coupon is used. Requires Free Shipping to be enabled. Coupon expiry date – Date the coupon should expire and can no longer be used. Expiry happens at 12:00 am or 00:00 on the date chosen. If you want a coupon to be valid through Christmas Day but invalid the moment Christmas is over, set the expiration date to YYYY-12-26 as it will expire on YYYY-12-26 00:00. It uses your site’s time zone setting at Settings > General > Timezone in WordPress. Leaving “Products” and “Exclude Products” blank allows the coupon to be applied to the entire store. Usage limit per coupon – How many times a coupon can be used by all customers before being invalid. Usage limit per user – How many times a coupon can be used by each customer before being invalid for that customer. Once you’ve configured all settings, select Publish and your coupon is ready to use. Once coupons are published, go ahead and make available to customers: Copy the title and send, advertise it via email, social media and onsite banners. In WooCommerce 3.2+ coupons can be added to (or removed from) orders in the Edit Order screen. Orders must be unpaid and you need to know the coupon code you wish to apply. Coupons are applied to the product price before tax is calculated. To make sure taxes are then calculated correctly due to rounding, we need to split the discount across all items in the cart rather than simply remove an amount from the total. When you split a discount across the cart, naturally, half values could occur which in turn can cause rounding issues once everything is summed up. How do coupons impact tax calculations?